DESCRIPTION: The David F. Parker website was designed and developed by PTC Computer solutions. Doctor David Forster Parker has been credited with over 20 books and novels through his career. He has been a vibrant and present figure in the world of real estate development for over 50 years and continues to be involved as a speaker and participant in market research and consultant to developers. You can find out more by going directly to his personal website, www.davidfparker.com, or contact them directly at david@davidfparker.com or (904) 992-9888. Dr. David F. Parker of Jacksonville, Florida is an author and long time community development consultant. Dr. Parker is the author of several books on marketing and selling new homes as well as a handbook on selling your own home. More information can be found at http://www.davidfparker.com or you can discover more information on his book “Six Success Steps to Selling Your Own Home” at http://www.sellyourhomesuccess.com. 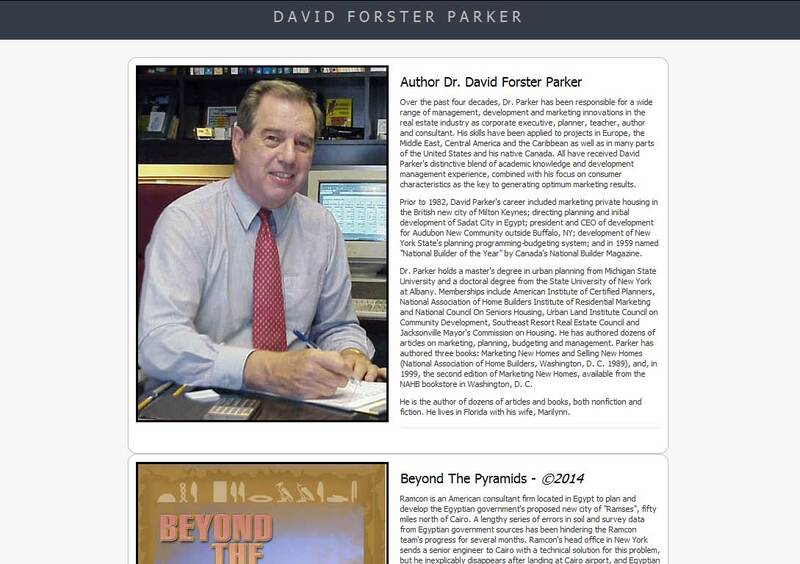 Dr. Parker’s novels are “Florida Land Grab” which can be found at http://www.floridalandgrab.info and “Beyond the Pyramids” at http://www.beyondthepyramids.com which is an espionage novel about the 1970s Middle East conflict and the peace that Anwar Sadat has in mind. Contact Dr. David F. Parker at info@davidfparker.com for more information or PTC Computer Solutions at info@ptccomputersolutions.com if you are interested in your own quality website design or are an author wishing to be published. PTC Communications, a subsidiary of PTC Computer Solutions, has edited, formatted, and published a number of books and can self-publish your book at a very low price. Contact us today for your publishing and printing needs.